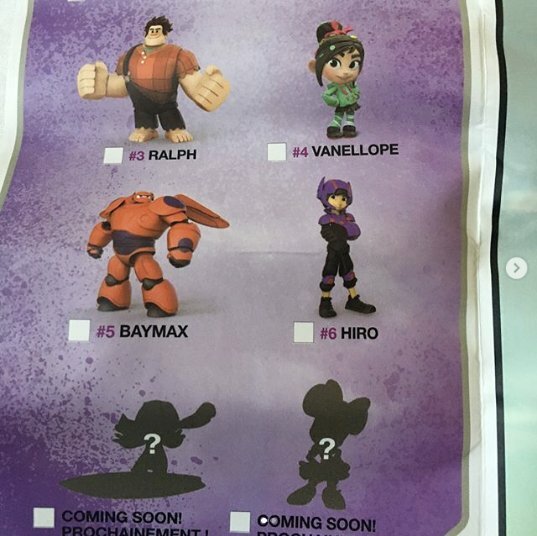 So what is and isn’t Wave 6 I’m not 100% on because there doesn’t seem to be an official website and different websites say different things and the flyers included with the toys are often wrong. There are also images of sets that should already be out. I’ve seen images of the Toy Story set which makes me a bit sad that I bought Buzz already because buying a set would make so much more sense. The rumor is that Frozone and Bullseye both have their own codes so they should be released separate, but they aren’t shown on the lists or grayed out so we’ll have to wait and see. I hope we get them. 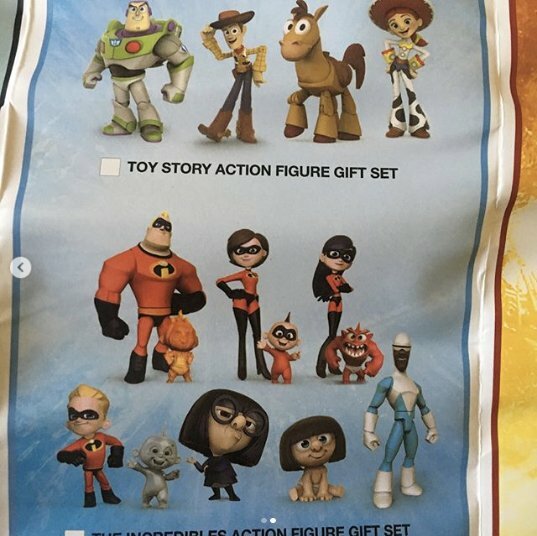 Also, wtf is that between Edna and Frozone? The Star Wars sets look so cool (can you tell I’m a fan lol). Han Solo was going to be my next purchase and I’m glad that I waited. I do wonder how big the Falcon is and if it does anything besides look neat. 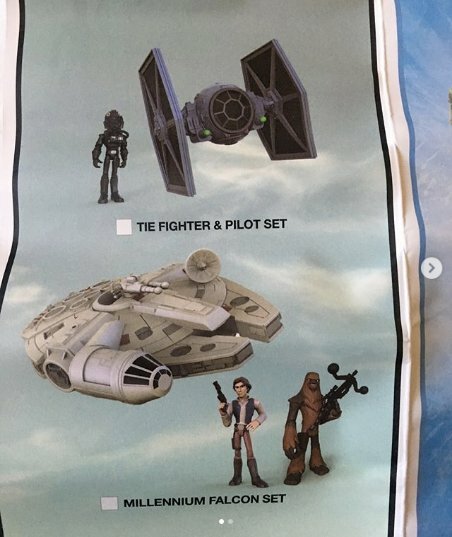 We’re also shown a Tie Fighter and Pilot set that’s interesting. Other than that, though, there are no clues about what’s coming out for Star Wars next. 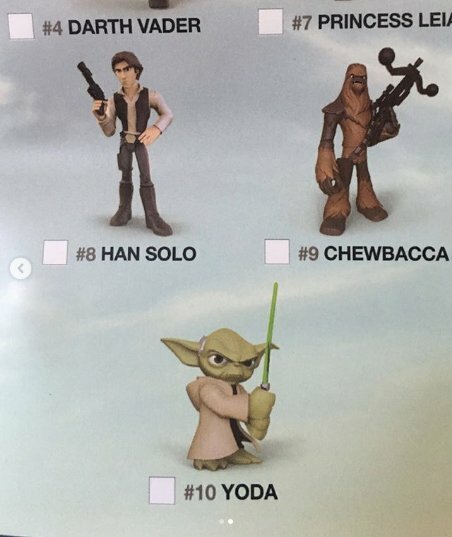 Yoda is shown, but he should be in stores and be a part of Wave 5. Based on these images Thanos should be out, though, I haven’t seen him anywhere. They’ve also listed him as #12 but Gray Hulk has been assigned that number. So are we getting Thanos? 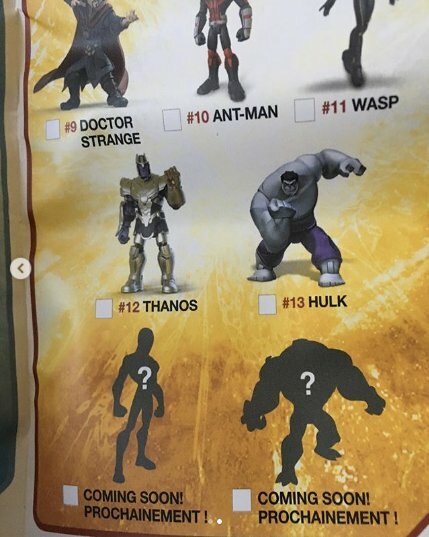 The speculation on the forum is that the grayed out figures are part of Thanos Black Order and I can certainly see that in the silhouettes, but come on, seriously? We’re getting bad guys before some more female characters? Ugh. Come on Disney. The grayed out images for the Disney line seem to be Minnie Mouse and Stich. Minnie makes sense since we’ve got Mickey, but I’m kind of hoping I’ve missed the guess with Stich because that doesn’t really make sense. Is there a new Lilo and Stich movie coming out? A TV show? Seems a bit random. I’m sure it’s probably the same person or team working on all the lines, but the Star Wars and Pixar lines seem much more thought out than the Marvel and maybe now Disney. I hope I’m wrong, and just based on Google searches it’s entirely possible those silhouettes could be wrong. We’ll just have to wait and see. As of right now I don’t have a release date for any of the Wave 6 figures. There is going to be a Live Action Lilo and Stich movie so maybe that explains the new Toybox figure? Still seems a bit early, but at least it’s not so completely out of left field. It seems like the Minnie Mouse and Stich images were incorrect because we’ve now got Maui and Moana figures in those spots. So basically, the flyers are nice speculation but take them with a healthy dose of salt. 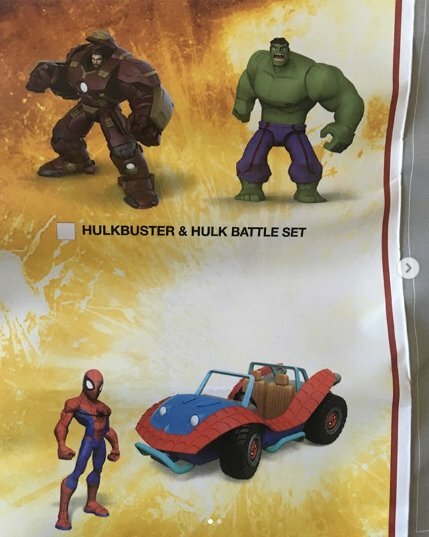 Based on information from the newest insert in the Miles Morales Spider-Man figure it doesn’t appear as though the Black Order or Venom is going to be in the Marvel line. At least for now. This really drives home the point that you can’t count on the grayed out images actually coming out. Though, maybe they’re just delayed.